Let’s go back in time a bit when I first started writing this article. About a year ago, I was in line at Starbucks and struck up a great conversation with a first-year college student. He was attending San Jose City College taking general courses. 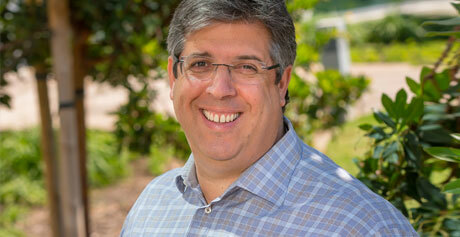 He shared with me some of the pain his family went through during the Great Recession. He told me he didn’t want to be in the same position as his parents when future recessions come around, struggling at an older age looking for work. He asked me how I did in the recession and if I had any suggestions. I told him that I did and would put some ideas in an article that I was writing. For me, diversification and seeking expert advice was key. I believe that some of the things I did many years before the recession, someone can still benefit from, however I do see a storm in the not so distant future that I’m very much concerned about. The story starts almost 20 years ago when my wife and I were coming home from a weekend trip in Lake Tahoe. We stopped for lunch at the Arden Hilton in Sacramento. Before we left, I grabbed a water in the gift shop and actually did something I rarely do... purchased a newspaper. On that day, that newspaper changed our lives. That night I read the classifieds and told my wife, that I thought it was time that we become real estate investors. The next weekend we were back in Sacramento checking out investment property with a local real estate agent. That’s how it started, buying Duplexes and Fourplexes in Sacramento. We chose multi-units as opposed to single family for the monthly income. Sacramento was at the bottom of its 10-year housing cycle. Property was simply dirt cheap; Duplexes for $30K and Fourplexes for $75K. I have found that real estate is one of the only investments that consistently delivers high returns. My personal experience, within the right market, has been to achieve greater returns on my real estate investments than my stock. Throughout the U.S., cities that suffered during the “Great Recession”, presented themselves as rebuilding and investment opportunities. Communities in Ohio, Indiana, Texas, Michigan and elsewhere offered a great chance to buy assets that are now increasing. Opportunities are around all the time, if you’re looking for them and welcome them when they present themselves. In fact, a recession can be the best possible time to begin investing because asset prices often fall hard. In the “near” future I believe there will be opportunities in areas like Fort Lauderdale FL, Camden NJ, New Orleans, Toledo Ohio, and Baltimore. However, there are some risks that I will get to. Secondly, I also recommend interviewing and getting together with a good Financial Advisor with whom you’re comfortable. Although you might not find agreement on every strategy, their perspective is educational. I recall meeting with one advisor, a very intelligent guy who knew his business. I agreed with him on most things, but we felt differently about how wise it is to pay off your house. For me, it’s a great peace of mind, but his point was that I would lose the tax savings on the interest. On the subject of taxes in general, take a deep dive into a class that teaches how to preserve capital. Find out about various tax shelters and how to preserve what you earn along with legal tax write offs that are available to you. You would be surprised to know that some of the ways the ultra-rich use to preserve capital are available to most anyone. So, what’s this coming storm that I’m concerned about? One thing I remember being stumped on is when the aforementioned student asked me what he thought what would be a good career path. I really wasn’t comfortable sharing what I was thinking about the future because I could tell there was still a lot of pain his family was going through. For some time now, I’ve been putting time into researching and talking with people who are more into or more knowledgeable than me about what’s happening regarding Artificial Intelligence or AI. For my purposes, I lump together automation, robotics and the intuitive decision making of AI. I’m not a scientist, I’m not an engineer. I’m just a regular guy trying to educate myself with reliable sources to understand the potential of it all, like extending human life and the downside like wiping out jobs and industries. What really amazes me is the average person’s lack of general knowledge on AI. This is very scary. I’ve brought up the subject of AI to a lot of people simply to find out that not many people are aware of the fairly recent advancements that have been made. Yet, most of us go to a supermarket or knows someone who does that would hopefully see of how a simple thing like self-checkout impacts the job market. I try to follow those who are in the heart of pioneering AI and read papers from professors from some of the best universities in the world. 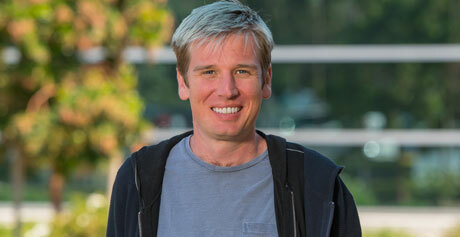 I also try to follow other innovators and entrepreneurs to learn how they perceive advancing technologies. I encourage everyone reading this to see what Bill Gates and, especially Elon Musk have to say regarding AI. Almost every day we see the effect of trickle down technology. What’s “here” and what is coming is very different from when the horse and plow were working the field and were replaced by the tractor. We still have tractors in the field; the only difference is that no one needs to drive them. Let me share with you a few things that are already here. 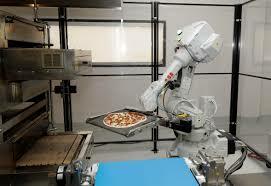 For starters, there is a robotic, high-tech pizza business that uses high-tech pizza trucks. Next up is a robotic burger place that’s coming to San Francisco. I believe our shiny friend will make you a gourmet burger in 10 seconds. The robot does it all from start to finish, from prepping your burger to bagging it without any human help. The grocery industry has nearly 3 million workers. Let’s face it, labor accounts for most of the expense in supermarket operations. Where do you go…maybe self-check? What do you see? I see four to six registers with one store employee to help someone who may not know what to do or gets stumped when they need to price a bag of apples. Remember, one employee running four checkouts…that’s three jobs lost multiplied by how many stores? Amazon has launched smaller test stores, with 10 humans…going down to just three humans. Much larger stores are coming. Follow that with Walmart’s recent announcement that it was launching a Silicon Valley innovation center to identify with future trends in retail. It will be known as Store No. 8, focusing on fields of robotics, augmented reality, and artificial intelligence. A 2016 Los Angeles Times story points out that the trucker industry is close to a $700 billion play annually and could suffer a 1.7 million job loss in the next decade. Some might be absorbed into the economy, most not. Next the other drivers … cab, ride share, pizza drivers, etc., most of these jobs will go away. Tech giant Intel recently purchased Mobileye, a leader in computer vision for autonomous driving technology, for $15.3 billion. Many other companies are in the AI race like; Facebook, Google, Apple and IBM along with many others. Ford Motors in early 2017 announced a very aggressive plan to provide fully autonomous ridesharing by 2021, further eliminating those that depend on driving jobs to make a living. What about those items you purchase online delivered by FedEx or UPS? There’s already drones starting to make deliveries … also in the test phase are mini blimps. What about the armed forces? Most will probably be replaced by Warrior Drones. How about our farmers? Many farmers are already using driverless tractors and fleets of robots that can do the job more efficiently than humans. How about the Bonirob…a robot that can kill weeds faster than any human or herbicide? What happens to over 300,000 of California’s farm workers? Even former President Obama and the Council of Economic Advisors warned Congress in 2016, that half of workers who are paid less than $40 per hour could be displaced by robots as early as 2030. 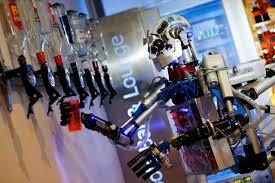 Say hello to Humanoid robot bartender "Carl". 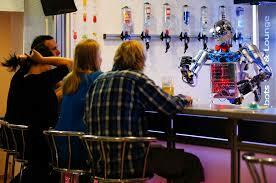 Carl can mix up one heck of a cocktail for a guest at the Robots Bar and Lounge in the Eastern German town of Ilmenau. And Carl has been pouring drinks for the last four years. In Japan, Panasonic introduced their latest – say hello to the Reji Robot which takes self-check out to a new level. Your basket tracks your purchases and by the time you get to the register – hence the name Reji - this guy will scan and bag your groceries in no time. Do you think it’s just blue-collar jobs? According to MIT Technology Review (https://www.technologyreview.com/s/603465/the-relentless-pace-of-automation/) approximately 83% of jobs that pay less than $20 per hour are under threat of vanishing. Jobs that have been with us for decades that every day Americans rely on will disappear from fast food jobs to grocery clerks. It’s true, blue collar jobs will receive the brunt of new technologies however, those working in white collar jobs may have to look over their shoulders as well. What will become of the stock trader when auto-enroll savings accounts become the norm? Maybe we’ll become better savers and investors when we all have our investments made based on an algorithm. Then there’s the robot that will help prepare an attorney for trial. Say hello to IBM’s “Watson” who can whizz through millions of documents in minutes. One of the most expensive legal costs of going to trial is the research and preparation. What if your personal robot will do it 24/7 at a fraction of the cost? Again, my opinions are based solely on my personal research. It’s hard for me to imagine that we won’t experience worldwide unemployment at a rate in the 40% range in the coming years, although there are those calling for 70% or more. I think there will be jobs for delivery dispatchers, operating engineers and of course there will always be a need for emergency crews. There will also be an increase in law enforcement opportunities as well … sorry, I think crime is going to escalate big time! Now keep in mind - if my prediction is right and there’s 40% unemployment - the 60% who remain working, how much will they be paid? Remember, we’re basically automating our society. That means the price of goods and services will go down…expect wages to reflect that. Currently the world’s top tech companies are in a race to develop the best AI and capture the massive markets that go with it. Yes, things will get better if AI helps people do a better job. But at what cost? We’re talking about major changes in our life. There aren’t too many people left in the world today who can say that they saw the birth of the car and the airplane. Yet today, most of us have witnessed the advance of technology develop at faster and faster speeds. Are there any solutions for those that have suffered job loss and wage reduction? Actually, maybe. Some countries are currently looking at a policy of “Universal Basic Income.” Finland is dong a test with 2,000 citizens offering them approximately $598 dollars per month. In the Netherlands, they proposed a referendum offering adults $1,067 and every child $213 per month. There are a few other countries experimenting with this concept as well. How likely would the U.S. apply this approach? Imagine if everyone in the United States received a $1,000 check each month…we have around 340 million people, that’s $340 billion per month, well north of $4 trillion a year? I don’t think the U.S. will go there, especially since we’re over $20 trillion in debt now. Keep in mind, the test is to see how people will cope not being able to function in society since there will be little to no work. Here’s my question … what are our elected officials doing to help prepare the citizens and future generations of our country? I’m sure there will be a tax placed on each robot. However, on a per unit basis, with fewer robots than previously employed humans, it would likely amount to a shortfall. Are there any benefits to AI? I haven’t even touched on the impacts that AI and robotics have had and will have in the medical and healthcare fields. AI may not only save lives, but give us longer lives. I’m just not quite sure what we’re all going to be doing between the ages of 85 to 110. Will it be a good quality of life or just a bank draining endeavor into poverty for the patient? Perhaps a boon for aftercare institutions and retirement communities! Some may ask if I really believe in what I’m writing in this article… absolutely! Getting back to real estate and my own plans. I’ve owned and have rented out for years a home in San Jose on one of the most sought-after streets in Willow Glen. It’s been in my family for decades. Just this year, I decided that it would be best to take advantage of the shortage of homes on the market and jump into the multiple offer game. As hard as it was to let go, I feel I made the right decision. When AI gets closer to our daily lives, I think more people will think…is my job next? I think that those who own homes will start to sell to raise capital. As the supply of homes increases, the prices will drop. This will be the beginning of a much softer market. My wife and I have contemplated early retirement, however, I’m taking on a hobby in the last year that’s been successful and will be expanding on it. It’s one of my “just in case” diversification strategies to retain a revenue stream. The risk that I spoke of earlier in this story? I have to wonder what will happen as the U.S. continues to downsize its work force. There’s a catch phrase that has been very true in the past, in the present and will most certainly be in the future… “Cash will be King.” After all, if AI is going to possibly make us healthier and live longer, don’t you want to have the financial resources to enjoy it? Have you heard news bytes about Bitcoin and the digital currency market? Is Bitcoin going to be the currency of Artificial Intelligence? Maybe, AMD and Nvidia think so as they are battling after the Graphics Card and Mining Business. This article is a bit over 2,500 words. I could have gone into more detail. My goal isn’t to put a dark cloud over us, it is however meant to bring awareness. As I shared my own examples of how I’m making changes and adapting in my life…we all should take a good look and do some planning. We have to ask ourselves…are we ready emotionally to have all this technology in our lives? Finally, I will pass on what has been told to me. It’s no longer a question of “if” … it’s simply a question of when.